Piezoelectric material's first widespread application in electronics was in the form of quartz crystals that were cut along certain axes in order to provide resonance at specific frequencies. They are still used in modern circuits as frequency-determining devices in oscillators and as frequency-selective devices in filters. Many high Q and tailored frequency response applications are now using polycrystalline ceramics for surface acoustic wave (SAW) devices where crystals used to claim an exclusive domain. 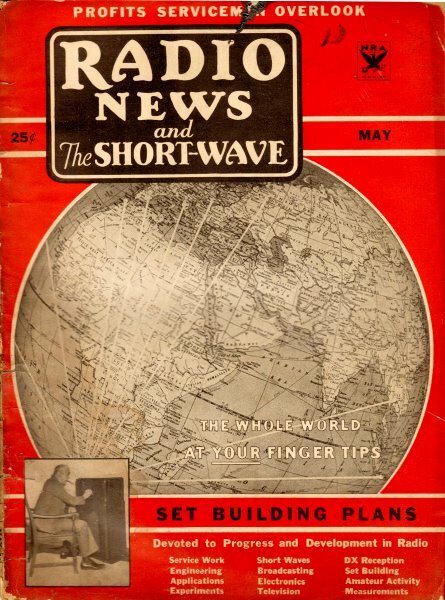 This article provides a bit of theory of operation as well as application in radio circuits using both fundamental and overtone frequencies. 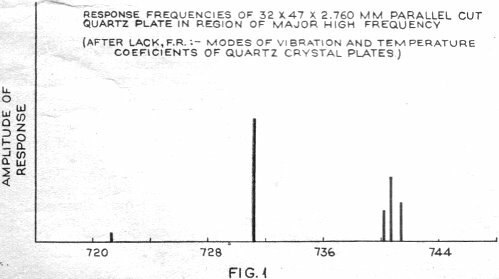 Response frequencies of 32 x 47 x 2.760 mm parallel cut quartz plate in region of major high frequency. The strains in a crystal are approximately proportional to the applied potential difference and if the potential is reversed the direction of the strains is reversed also. It follows, therefore, that if the potential is alternated in direction the plate will be set in vibration at the same frequency. The dimensions of the plate cause it to have various natural periods of vibration and if the frequency of the applied voltage is made to approach one of these natural frequencies (different along the different axes) the response of the crystal increases until, if the two coincide, resonance occurs and the amplitude of vibration may increase several hundredfold. If the applied voltage is too great, the crystal can be broken by the violence of its own motion. When a crystal is made to vibrate in this way, thereby calling into play the converse effect, the direct effect is also involved, for the motion of the plate with the charges on the faces gives rise to electrical reactions on the circuit which is being used to supply the alternating potential difference. The frequency at which the reaction takes place is in most part dependent on the dimensions and the elastic constants of the material. By accurate grinding the natural periods of vibration along the various axes can be made any desired value and thus gives a simple means for obtaining frequency standards. A device of this sort is called a piezo-electric resonator. One crystal can furnish a number of frequencies anyone of which can be called into action by the proper adjustment of the driving circuit, for in addition to the natural periods along the three axes the overtones of harmonics can be used. These are 2, 3, 4 (and so on) times the fundamental frequencies. Response-frequency spectra of a parallel cut crystal plate at different temperatures illustrating the interchange of activity between the two frequencies as the frequencies f the two modes of vibration pass through a coincident value. Length of plate along optic axis = 47 mm. Width along electric axis = 19.35 mm. Thickness along third axis = 2.75 mm. We have considered a crystal plate working in a circuit which was driven by an alternating electric potential. A most important advance was made when it was discovered that a crystal could be used, in a vacuum-tube circuit, for maintaining oscillations of constant frequency. A number of circuits were worked with before the present ones were evolved, and although it is still not ordinarily possible to obtain much more than a watt or so of power directly from a crystal circuit, it is always possible to amplify to any desired power level. The uses to which the direct and the converse piezo-electric effects can be turned are rather impressive. We have mentioned before the use by the Curies for the measurement of movements of 1/10,000,000 of a centimeter. It is interesting to note that interferometry allows measurements to slightly less than 1/10,000,000 cm., and although it has at present many more chances for application, the crystal methods are superior for some purposes. Crystals can also be used for the measurements of high pressures, as in the explosion chambers of large guns. High-voltage measurements have been previously mentioned; it has been used for the detection of currents as small as 1/1,000,000,000,000 of an ampere. (The vacuum tube is still ahead, being able to detect as little as 1/10,000,000,000,000,000 ampere.) Piezo-electric oscillographs have been constructed by Wood; the supersonic waves (in water) of Langevin are used for deep-sea sounding. submarine signaling, and for the detection of underwater obstacles. Pierce has used a quartz oscillator for the determination of the velocities of waves of high frequencies in gases. Crystals have also been applied the study of vibrations in heavy machinery and we may expect a rapid extension of its use to other laboratory and engineering measurements. Hund has suggested the use of an unsymmetrical quartz plate for the production of audio-frequency power. He has also suggested that a vibrating plate could be used as an optical shutter, making it possible to measure the velocity of light in a manner similar to Fizeau's mechanical shutter arrangement; a very important suggestion, since the velocity of light enters in such a fundamental way into the calculations of radio theory. The optical properties and the behavior of quartz are most interesting. There are many likely applications ahead in the fields of phototelegraphy, facsimile transmission and television. A crystal plate cut without reference to the orientation of the three axes will in general respond to a large number of frequencies. Plotting the response amplitude against the frequency gives results similar to those shown in the above figure, which has been called the frequency spectrum of the crystal plate. Usually there are one or more frequencies in the spectrum of a plate giving responses sufficient to drive a vacuum tube in the usual crystal oscillator circuit. Relations between major response frequencies and the dimensions of a plate cut by the Curie or perpendicular method are as follows: For this type of plate there are two major response frequencies, one high and one low. The high frequency which is a function of c, the thickness of the plate, can be determined approximately from the relation f = K/c, where c is the thickness of the plate in millimeters and K = 2.860 x 106 (giving a constant of approximately 105 meters per mm. of thickness). The low frequency is a function of b, the dimension along the electric axis, and is obtained by substituting the value of b in millimeters for c in the above relation. With the parallel or 30° cut there is a major high and low frequency, but in some cases the high frequency occurs as two response frequencies a kilocycle or so apart (termed a doublet).